Designed for children as young as 12 months and suitable for kids up to 5 years old, the Nenuco Bubble Bath doll by Famosa is a bath time favourite. This is a 35 cm soft bodied doll that can be fully submerged into water, yet it doesn’t soak into the body. 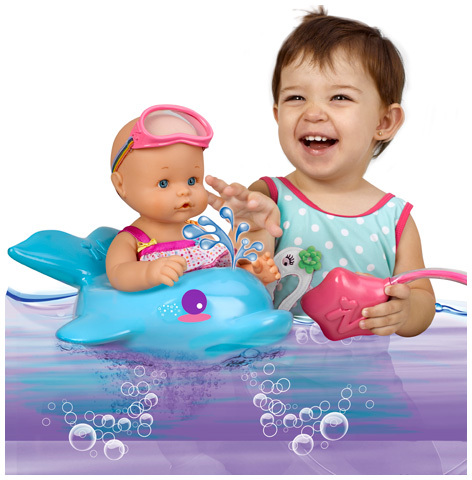 She has her own dolphin float, and when you squeeze it water squirts over her head as she blows bubbles below the water. This Bubble Bath doll includes a snorkel for underwater diving and also comes with her own float. This is in the shape of a friendly dolphin that squirts water and makes lots of bubbles with a simple squeeze. Adorably dressed in a polka-dot swimming costume and goggles this is a great gift that creates lots of fun at bath time. Please tell us what you think of the Nenuco Bubble Bath Doll by Famosa. I think she's adorable and just the thing for my granddaughters bathtimes.